Facebook released its fourth-quarter earnings report yesterday, posting a 51.7% jump in revenues and surpassing $5 billion for the first time, thanks to new advertising formats and an improved mobile app. Company CEO Mark Zuckerberg highlighted the milestones in a post on Facebook, thanking users for being a part of the community of 1.59 billion people. Our community now has more than 1.59 billion people. More than 1 billion people use Groups. Almost 1 billion people use WhatsApp. More than 19 million people who previously had no internet access are now connected through Internet.org. In 2015 people came together in many different ways on Facebook. We celebrated happy moments, from the Indian Super League to the release of Star Wars. Millions of people rallied to support Nepal after the earthquake, France after the Paris attacks and all those affected by the refugee crisis. And every day, hundreds of millions of people just used Facebook to connect with loved ones. 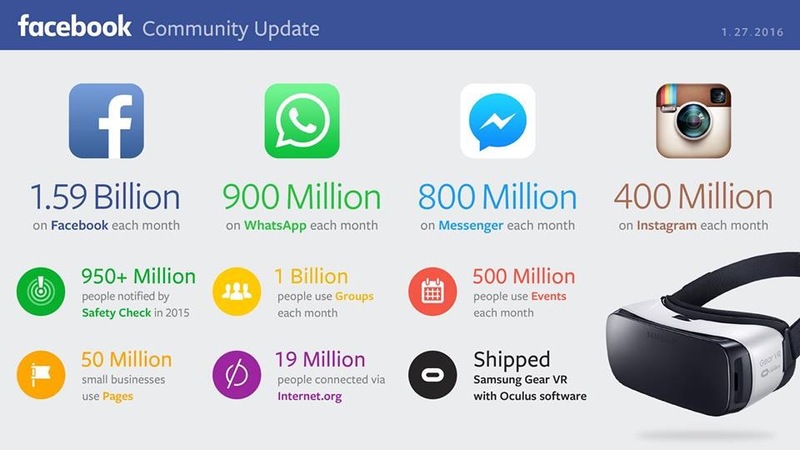 Facebook’s net income also more than doubled to $1.56 billion in the last three months of 2015. The company’s total revenue rose to $5.84 billion from $3.85 billion a year earlier, with ad revenue increasing 56.8% to $5.64 billion in the holiday shopping period. 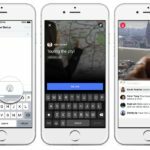 Earlier today, Facebook announced the launch of Live Video streaming for iPhone users in the U.S., with a worldwide launch to roll out in coming weeks.